LE Planetary eyepieces gives you high eye relief for greater viewing comfort, high contrast for improved visibility of finer details, high mechanical quality and rubber eyecups to offer you the most out of an eyepiece of this cost. Perfect for observations with any telescope. The LE Planetary eyepieces have the price of an entry level eyepiece but they offer better performances and will allow you to improve your telescope performances at a much content cost! In order to observe with the telescope at high magnifications you need eyepieces that have to be able to generate high contrast images, and that, even with short focal length models, offer a long eye relief, and a large upper lens for easier observations. Our LE Planetary eyepieces offer high contrast and 20mm eye relief: all at a great price! - High optical quality thanks to 7 elements design in 4 groups (5 elements in 3 groups for the 18mm focal length model) optimized for medium to high magnifications. The result is a contrasted and rich in details picture throughout all the field of view (55° apparent field view) to allow you better appreciate the finer planetary/lunar details, the smallest planetary nebulae, double stars or the most difficult stars that make up the core of globular clusters. - 20mm long eye relief for greater viewing comfort, even for people wearing glasses. - Superb fit and finish: LE Planetary eyepieces fit in any 31.8mm focuser and feature highest quality mechanical construction with fully anodized aluminum body. - Fully Multi Coated lens for sharp images without unwanted reflections. - Foldable rubber eyecup for convenient use both for those who wear glasses for those who does not use it. Each LE Planetary eyepiece comes with two protective caps for the lenses. - Great also for binoviewers: thanks to narrow housing, they leave space for the observer's nose, unlike other eyepieces that have a large housing and that can not be used with binoviewers. - Unbeatable price/performance ratio: we offer LE Planetary eyepieces at a price slightly higher than that of a normal Plossl eyepiece. LE Planetary eyepieces allow you to improve your telescope performances at a much content cost! Outer lens size comparison between 12.5mm LE Planetary and classic 12.5mm Plossl eyepieces. The LE Planetary eyepieces have beed reviewed by Paolo Casarini, here you have parts of his review (entire article available in italian language in the dark-star.it website). It must be said that the new LE eyepieces (acronym that recalls the eponymous Takahashi series) are actually beautiful both from the aesthetic and mechanical point of view. 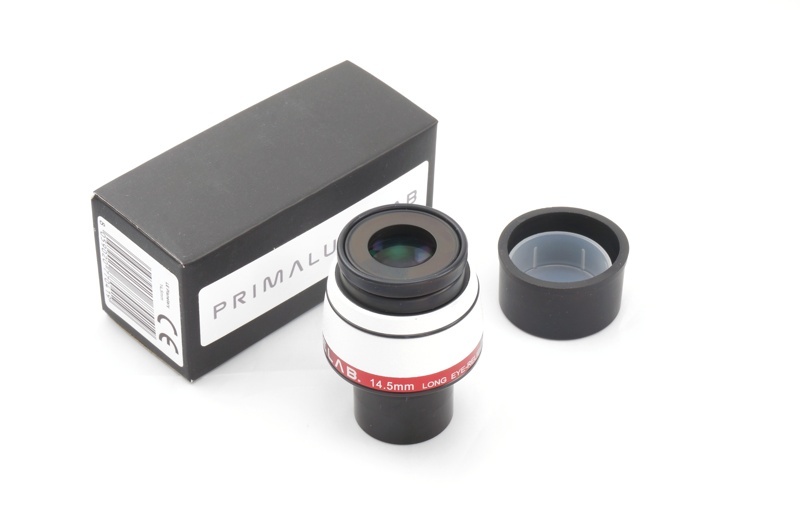 I imagined that these PrimaLuceLab were not at the level of the best planetary eyepieces in circulation ( including new orthoscopic of various brands ), both for the multi-lens scheme, both for the purchase price. But I must say that the difference is not high and that this series of great price eyepieces (note that the list price is 79 euro each, very low) is well made an , except for some small flaws, it's a good choice for the amateur astronomer searching for an almost complete set of focal lengths at competitive prices. They are well constructed, beautiful to look at and have performance in line with the competitors. Every LE Planetary eyepiece has: eyepiece, 2 caps (one upper and one lower), eyepiece box.